Archives of Eaton Bray News for August 1956. This article was published in August 1956. Please see Latest News for more recent information. 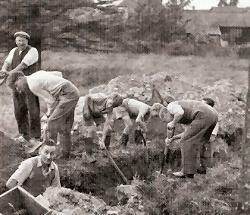 Many hands make light work - and save their parish church money. 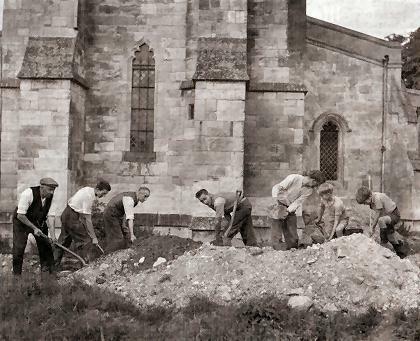 When the vicar of Eaton Bray, the Rev Peter Graham, needed a drainage system digging around St Mary's Church, parishioners were only too happy to help out in August 1956. Here young and old set to work digging a ditch, while, left, volunteer workman Wesley Maunders really gets down to it by digging a manhole. It was hoped to have the work completed before winter set in. You are viewing the August 1956 archive.